Just when you thought you had your eating habits all figured out, be ready to be both entertained and enlightened by the freshly published Fat Suit Study, out of Cornell University’s Food and Brand Lab. Quite apropos for today’s holiday of (over)eating, wouldn’t you say? Food psychology researchers lined up 82 undergraduate college students and one secret actress for a pasta and salad lunch study. Those 82 students were randomly assigned to 4 different eating scenarios featuring the actress with and without her prosthesis, a “fat suit” that added 50 pounds (ca. 23 kilos) to her normally average weight. She did this funny thing of calling attention to herself by speaking loudly and then immediately followed it by serving herself a helping of pasta or salad. Sometimes she served herself quite healthily and… sometimes she really overindulged. The results were pretty staggering. You might be surprised to find out what can actually prime your brain to eat more or eat less in relation to your eating companions and those around you. The good news: it can be easily remedied by some simple, preparatory self-assessment before you even leave the house. Read on for the real dish on dining influences! Did you ever stop to think of how socially connected we are to the food we eat and the company we keep? Reflect for a just a moment on your personal, social relationship to food. Do you think you could (unconsciously) end up eating more when dining with “larger” friends? 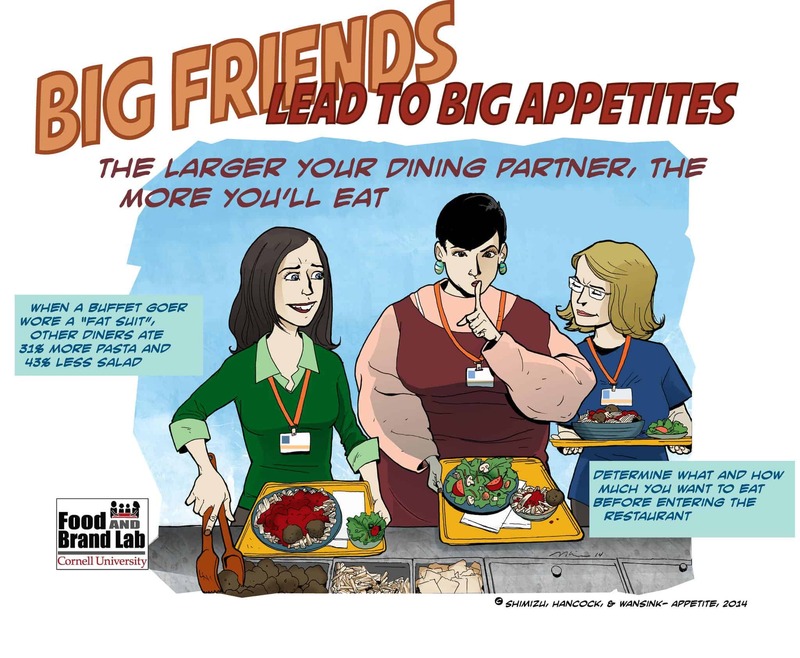 Conversely, do you think you may end up eating less when dining with slimmer, more slender friends? If so, what is the cost of these subconscious actions in relation to your own health goals? This could be a worthwhile consideration for yourself and/or a really good share for your client or those you help. It reveals how much the company you are with influences how much you fill your plate. Or not. It’s part of the contagion effect concept, whereby our eating behaviours can be influenced involuntarily whilst in the company of others. It turns out that this food contagion is a real thing. Commitments and contagions – where’s the line? Remember we previously spoke about the social contagion effect with respect to goals of moving more and eating better when trying to install new habits? ‘Goal contagion’ is a scientific explanation that has been shown by researchers to inspire new behaviours unconsciously. Research has shown that a goal can be activated in your subconscious, without you even knowing that the goal is influencing you. This applies to eating food too. Let’s get back to the results of that Fat Suit Study. In that Cornell University study, recently published in the journal Appetite, researchers found that when the actress wore the fat suit, and looked overweight, the other participants served and ate 31.6% more pasta, regardless of whether she served herself mostly pasta or mostly salad. Even when the actress served herself more salad whilst wearing the fat suit, the other participants served and ate 43.5% less salad. The not-so-skinny findings illuminated the fact that people may serve and eat larger portions of unhealthy foods and smaller portions of healthy foods when eating with an overweight companion. Why? Simply because we unconsciously come to be less in tune with our own health goals. Think about it: family meals, power lunches, and business dinners. Whilst food is by no means the only way to build stronger relationships with friends, colleagues, family and community, we’re immersed in the social eating dilemma every day. If we want to stay on point with our own health goals, then we must consider those preparatory adjustments that will help us self-serve skinny, rather than plump. One of the Fat Suit Study researchers, Brian Wansink, PhD, director of Cornell University’s Food and Brand Lab, tells us that we can easily avoid getting into such a conundrum. He advises us to do something sincere and simple: assess your level of hunger before even going into the restaurant. Look up the menu beforehand and select a meal that suits your dietary goals. Or, if you’re going to a buffet, pre-commit to selecting modest portions of healthy foods and with that goal in mind, those around you will have less of a negative influence over what you eat. Be real with yourself and clear in your idea of what you’re about to walk into. This can help you plan accordingly. Have you ever experienced this? Has a client ever revealed this scenario to you? Maybe you were not even aware of it, but now you can evaluate whether the physical appearance of those you dine with has played a role in what and how much you eat. Join in the community conversation below with your comment to let us know and help each other out. And please share this with someone who might benefit from learning how eating companions may be influencing their behaviours around food. I think it affects me to a certain degree. I have food intolerances so there is limit. However I do eat more in social settings where there are plenty of vegan vegetarian choices. I’m surprised at the result of this study. I always look at overweight people and think more about my own diet. I would like the study to have a greater age range. I assume students would be in the younger age group and have the assumption ” it will never happen to me”. Also I would like to know if the test group had any interest in sport or nutrition. As this may be an very different result if so. Advice on choice before you enter the restaurant is a good tool. I will try to put this in to practice. What an excellent read, something to talk about at the dinner table!! I believe that we tend to eat healthier when our eating companions are healthy themselves, I have sporty friends and they have been a really good influence personally. Larger people! If I was overweight and reading his article, I would feel isolated and believe that everyone skinnier than me wouldn’t want to have lunch or dinner with me because they would see me a large plate on my face and imagining me stuffing my face! I agree with the company of group, I notice myself that I eat a lot motr without noticing the amount of the food intake when I am surrender by a group of friend during dinner or lunch because simply we talk a lot and won’t remember what we out on our plates but singling out a larger person is a little harsh in my opinion! Hello Fifi I lost a stone and have three more to go and I dont feel bad at all about this study, I actually love it, it makes me think how much of the weight I piled over the years may have had something to do with my friends and family. Not long ago I joined a cycling group and seeing my new friends who are very healthy and sporty motivates me a lot!! With the explosion of ‘all you can eat’ carveries and other eating establishments, together with larger portion sizes, I am aware that I can easily overeat when frequenting such places with others, who invariably overfill their plates and/or go back for more. I am also slightly surprised at the result of this study. As Bryan said, I often look at overweight people and think about what I am eating. I also find that many of my larger friends are self conscious when eating socially and tend to opt for healthier options or no sides. I actually find that the worse influence when eating socially are university students as they tend to go for the cheapest option that provides them with the most food. I think that when eating with company who are health conscious in the same way as you, then you influence each other to make the best choices. Yes I always wondered why in burger and junk food tv ads they put plus size families, as though they want you to feel less guilty or something! Well, you got to live a little. Life is too short to worry 100% of the time. Seeing the look on their faces is ‘double’ delight. This is so true!!! It explains my past indulgences with many of my colleagues at work who aren’t on the healthy side of the scale, i gained a lot of weight as a result.. no offense to them but I think I need to hang out with people who are more aligned with my goals, like Laura. I need better influences in my life and it may sound selfish but my health comes first. Thank you, this gives me a lot to think about! This is absolutely true! Everytime I go to my mother in low’s howse, I eat unhealthy high calorie food, because everybody there are doing it! I have mention this long time ago, but she is my husbands mother, and I cant stop going there…they live only 2 km. from our house…and it take us 30 min. to go there walking…so I started to sit on the computer, while everybody are eating, and it helps, but not everytime…sometimes I’m taking with me unrefined oils, and some vegies for salad:)), and eat only salad….but tell me how to explein why I do not whant to let my children eat their grandmothers food….When I got married 14 years ago, I whas eating only salad, and bananas…and I whas wondering haw it is possible that this people eat so unhealthy food….but naw 14 years later, I eat the same food sometimes, and with plesure…. I also agree with Bryan. When I see overweight people eating it makes me more conscious of what I am eating. However, I do find that when I am with a group of friends their food choices influence mine, especially when it comes to appetizers and desserts. I wouldn’t normally have either but when I am with friends and they are having either or both I will also choose to have either or both. Yes, I notice almost everyone would have dessert if one of their eating companion starts to order something. At least, they would agree to share the desserts. When i was living with my big-eaters housemates, I definitely ate more during my entire university’s years! This is a very interesting perspective! Consciously I tend to find myself doing the opposite… I am immediately disgusted by overindulgence in a social setting, particularly if I am aware of any health conditions the persons may have. I remember going into a Pizza Hut for a buffet lunch by myself and being the only average-sized person there… I hardly ate anything as I was more concerned with the fact that some of those people think its a normal thing to do… am I the only one? ?